Product information "Digital Devices OctopusCI S2 Pro Advanced - Twin CI and Twin DVB-S2 Tuner forr PCIe Slot"
Dual TV tuner for DVB-S / S2 and digital satellite radio with 2 CI modules OnBoard for the PCI Express slot with newest demodulator (STV0910A - Improved compared to the version STV0910B) technology for high DVB-S2 transponder data rates up to 180 Mbits. The Full profile PCI Express card transforms a compact PC system into a Media Center PC for your living room with double TV enjoyment, thanks to the parallel usable 2 TV tuners (twin tuner). To receive any time digital radio and television via DVB-S / S2 in the highest quality. Customers with a satellite TV connection can receive in HD quality without smart card the public HD TV channels (ARD, ZDF, third party programs, and in addition many radio stations). Numerous private TV channels are free to air on digital satellite. For the complete reception of all programs (content depending on their contract concluded with the content providers) use the CI interface extensions on the card. Our products are under the Windows Media Center, including the optional direct support of the CI interfaces, immediately usable without complications. The Twin Common Interface on the OctopusCI S2 Pro provides the system with two CI slots and is designed to use with two Conditional Access Module (CAM). Some CAMs handle the Multi Transponder Decrypting (MTD) technology, which allows up to 4 TV channels / tuner only a CAM (number dependent on the manufacturer) to decrypt. What is Multi Transponder Decrypting (MTD)? Multi Transponder Decrypting is a new technology that allows to decrypt up to 4 TV channels / tuner simultaneously with only one Conditional Access Module (number of channels dependent on the manufacturer). Note: The Ocoptus CI S2 Pro Advanced has no direct possibillity to connect extension modules (DuoFlex Twin Tuner and DuoFlex / Flex CI). Expansion are over furthe PCIe Slots possible with other PCIe cards. 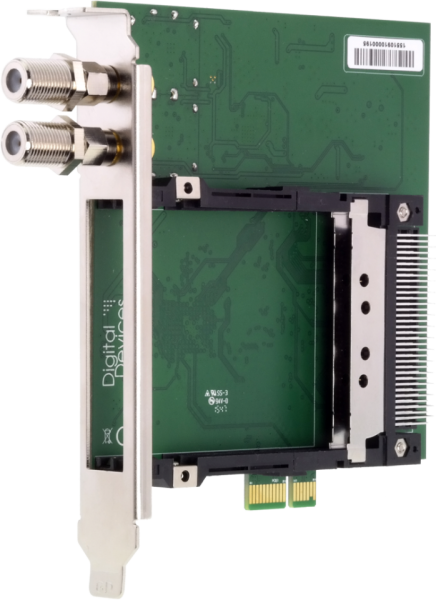 Related links to "Digital Devices OctopusCI S2 Pro Advanced - Twin CI and Twin DVB-S2 Tuner forr PCIe Slot"